Hi guys, Blog today will read a little different to others as I am devoting this article to a very special experience I wasÂ able to take part in during the week and that was rafting the headwaters of the wonderful river the Tongariro. 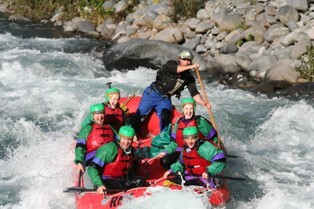 I was privileged to be treated to a truly breath taking experience while rafting through some of New Zealand’s best scenery with New Zealand Rafting Company. New Zealand Rafting Company have been about for quite sometime but have recently just estabilishedÂ a 5 star rafting headquarters in Turangi city centre offering the people of New Zealand and tourists of the world a truly superior service. 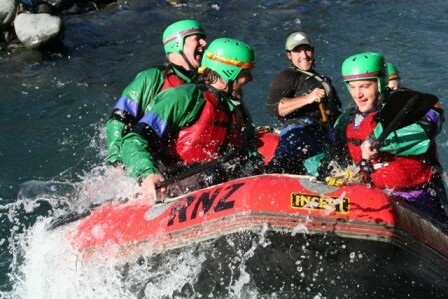 Rafting everyday these guys have great knowledge of many local rivers but know the Tongariro like the back of their hands and offer many different options from the relaxing family float to the thrill seeking junkie who wants to have an adrenalin filled experience. As you have probably worked out I was not entirely interested in rafting down the river but had something a little extra in mind like fish, which we certainly sawÂ a truck load of. Â The water we rafted was amazing and teeming with spawning trout which drove me crazy with no option but to just raft on past and admire as the river is obviously shut at this time of year. The reason for the recreational trips we are doing at the moment is for me to get to know the water and decide which parts of the river will be best to fish come the 1st of December when things open this summer. 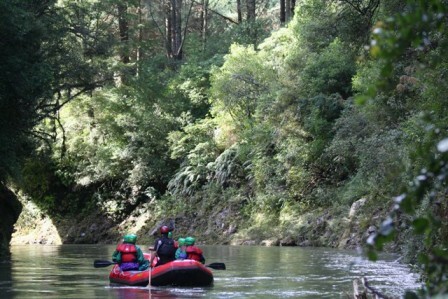 This summer I will be offering guided raft fishing in conjunction with New Zealand Rafting Company and I do expect it to be massive so I thought this would be a good time to get you guys interested and contacting me aboutÂ it as December and January is going to be the time to hit this part of the river with heaps of fish still holding in this water from late runs. I can honestly say that some of the water we passed was the most fishy looking water I have ever seen and the scenery was just second to none. The beauty about this trip is that the trout fishing is some of the best in New Zealand and the scenery will make you feel as if you have just flown into the back country and are fishing in a world of your own. The upper Tongariro is a series of gorges which creates beautifully deep holding pools but also offers great broken water which creates pocket water perfect for nymphing. WaterfallsÂ cascade of the cliff tops and add to the picture perfect scenery along with native forest and a wide range of wild life which seem friendly and untouched. Not only will you enjoy some of the best guided fishing in New Zealand but also be treated to some great rafting fun while under the safety of true kiwi river guides. These guys are amazing raft guides and will tailor the water to your needs meaning you can go the hard wet way or the easy dry way while still keeping things very professional. 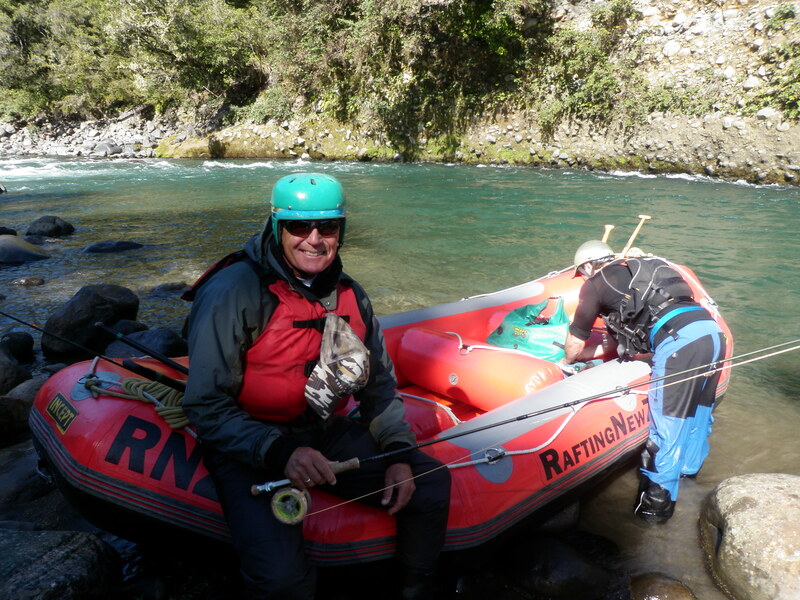 We are offering two different options with the guided raft fishing which enables you to choose from a day trip or an overnight camp out on the banks of the Tongariro. There is easily two days worth of fishing up here and the overnight option will make sure you don’t miss any potential water. When taking the day option we will concentrate on the most productive pools and raft through alot of other water making sure we are being picked up at the Blue pool by sundown. Some of the most productive water to concentrate on will be at the mouths of several small feeder streams which the trout gather around getting ready to shoot up for spawning. We spotted 20 plus fish in most of the good looking pools while rafting down the other day and that’s not counting the deeper pools you could not see in nor the fast riffley water which they could take cover in so the potential of big fish days is surely there. Dry fly with a dropper will is very productive at this time of year as it is just coming into our summer when cicadas start chirping and mayflies really start to have great evening hatches causing a huge amount of feeding action on the surface. Fishing a small natural asÂ a dropper in these situations account for huge amounts of fish in the fast riffley oxygenated water and will produce fish all day as they are always on the look out for emerging nymphs. This is my favourite style of fishing as its a relief to get away from those Tongariro bombs after a long winter. 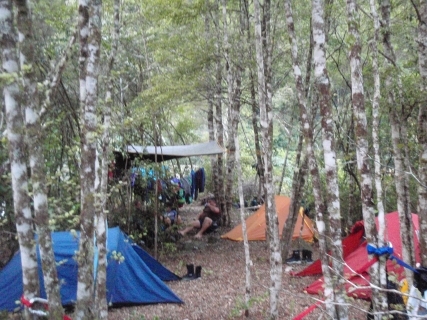 AsÂ a client choosing either a day trip or a two day overnight camp out you will not need to to supply a single thing as we have all the equipment to make your trip comfortable and memorable. You will have the luxury of having two professionals with you and will be able to enjoy all the fishing you want while one of us is setting up camp and cookingÂ a rather special dinner so you can just sit back with a beverage and relax. This trip would be perfect for two anglers which are interested in catching big numbers of fish and getting out in the bush for the night and forgetting about stresses of work or to take the wife or girlfriend away on a trip they won’t forget as there is plenty to keep them occupied if they don’t enjoy fishing. A good book a refreshing swim and the sound of running water is sure to keep them interested and enjoying the experience while you slay fish after fish from different pools as we raft down the headwaters. The only thing that may break the silence is the sound of screaming reels as trout take off down the river with a size #16 caddis in its mouth. The rafts are generous in size and can fit up to 6 people as they are used for everyday use in rafting adventures for just raft thrill seekers but from a fishing point of view I would see it being most productive by just havingÂ one or two clients as then there is plenty of water and you can both fish the same stretch before rafting on to the next. A lot of equipment will be needed for overnight camping like tents, cookers, spare clothes etc so they will be all stored in dry bags and attached to the raft again taking up valuable space. This is a very specialized trip and you will not have to go without anything except maybe a porcelain toilet seat. The summer fishing in the Tongariro is it’s best kept secret and now we are opening the opportunity for you guys to enjoy and discover the best raft fishing in New Zealand along with some very special breathtaking scenery. This trip is worth the money and you will NOT be disappointed from any aspects of the adventure-the guides-the fishing-the scenery-the rafting!! I really want this trip to work and would love to share the time with you all while fishing the headwaters of the Tongariro so please contact me and get more details if you need them because the more forward bookings we get the cheaper we can make it for everyone. I think December will fill up quickly with the package we know have available so get in quick and secure an adventure of a lifetime. Hope you enjoy the photos and can see yourself attached toÂ a fishing pole in here.